The mental game has always been one of the most interesting areas of sport for me. I've studied it at school and read a number of books on the subject, but understanding and teaching it are two entirely separate things. 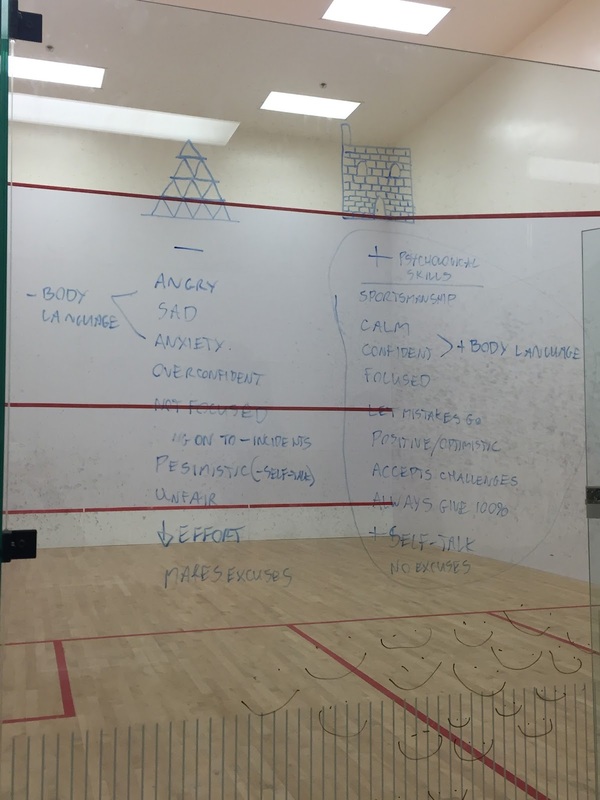 In this post we are going to look at some various sport psych areas that are critical to playing and competing at a high level and also getting the most of your practice sessions. Below are a variety of some diagrams from chats I've had with my kids this season so far about the importance of focus, refocusing and capitalizing on opportunities when your opponent has a lapse of focus. When someone loses their focus, especially a kid it can lead to easy points and often this quick run of points can be the turning point in a match. Let's take a closer look at each diagram. This first photo is an analogy of a simple screw a carpenter would use. We discussed how if you are a threaded screw you are prone to becoming unscrewed quite easily. A list of times when people are most vulnerable were made under this section. On the left we discussed how a tougher screw would be hard to get out of it's place. A really experienced and tough screw would also be able to screw in a bit tighter when they feel they've let it slip a bit. We made a list of a few ways that people can be tougher to unscrew; basically becoming tougher to crack mentally no matter how challenging the situation. In the second diagram there is a box in the top left corner about focus and a scale of it from broad to narrow, and being either internal or external. 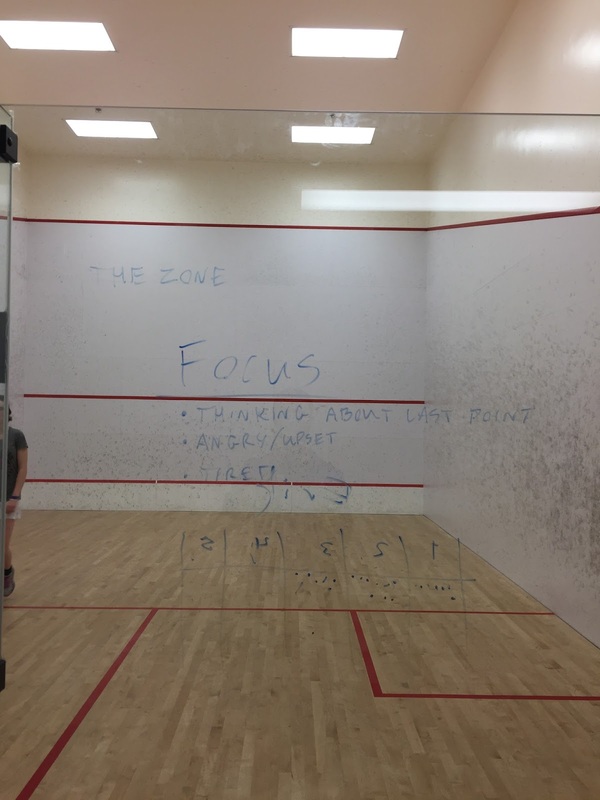 We talked about how playing in the zone your focus is in an optimal balance, without overloading on unimportant information. In the main part of this diagram we talked about chipping away at your opponent mentally and physically. As you get to a higher level it takes time to wear out your opponent and make them lose hope in winning. Greg Gaultier and Paul Coll are great at doing this because they are so tough to win a point against as they get everything back and don't make mistakes. They make any player dig super deep just to win a point, let alone 3 games. In this list we discussed signs of someone who has lost hope and the symptoms of someone who has been broken mentally and/or physically. Perhaps you lost the game, but it took everything out of your opponent, so if you are fresher and they are spent you are still in a great position even down a game. In the third diagram we talked about how getting up to the service box and getting your serve into play quicker than normal can be effective. When you're opponent is tired, upset or you have the momentum and are cruising are all excellent times to quicken the start of the next point. It's more about the psychological impact of this quick serve which is so damaging. We also talked about potentially doing this after a big rally where you and your opponent are hurting, but you feel you can disguise your pain and by serving right after can also psychologically defeat your opponent because they may be expecting you to take time and could be shocked that you are not experiencing the same pain that they are. This of course is risky as if you can't physically or mentally back it up and your opponent calls your bluff you can be in trouble. Finally we talked about when you should take time prior to a serve, which is basically the opposite of the times you shouldn't. In the next diagram we made a list of when people tend to lose their focus. Staying focused can be incredibly difficult in challenging environments or when you get tired, upset or into long rallies. What the kids did after discussing focus was they made a little chart on the inside of their court. Each kid has their own little table where they would simply make a little dot after every rally they played where they were not focused or lost their focus during the point. 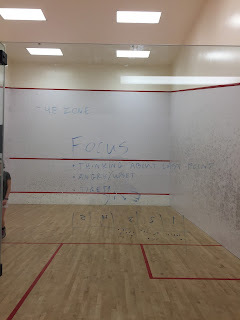 I found this exercise beneficial for the kids because it helped them understand their concentration during the match and made them take time to sort of reset to write up the dot and put the marker down by the court door. This of course has to be built upon so they can use a refocusing strategy which we have also talked about on numerous occasions. In the fifth diagram (below) we discussed the area that your zone for your best squash is. I drew a diagram of a dial and scaled it from 1 to 5 with 1 being sleepy, fatigued which are all low and negative arousal levels for playing a high level of squash. At the opposite end of the spectrum, at 5 was angry and nervous which can both be detrimental to your performance as well. 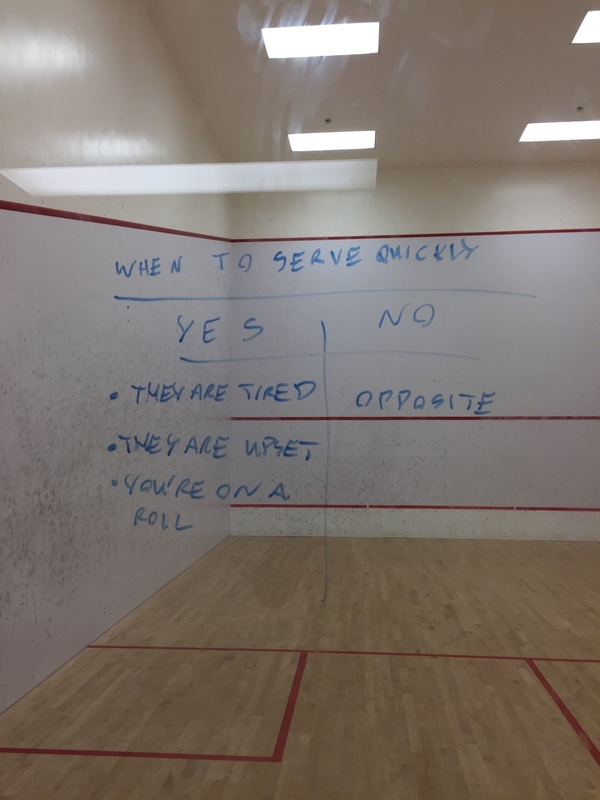 Depending on the individual personalities and your style of squash you'll probably play your best squash somewhere between 3 and 4 on this range. We need to constantly be self-regulating our emotions and arousal levels while we're competing and also training. Experienced players will be able to make adjustments quickly before they get too far from their optimal range, while kids generally wear their emotions on their sleeves, both positively and negatively and often need a lot of encouragement and pep talks between games and after matches to help them reset. In this final diagram we used the analogies of a house of cards and a brick house to symbolize how easily or tough you can be to crack or completely crumble. This is again similar to the screw mentioned earlier. We talked about what traits we would expect to see from each of these people. Someone who is calm, focused and confident will be tough to breakdown, just as a brick house would be. On the flip side if someone is unfocused, angry, makes excuses or is quite nervous they can fall apart like a fragile house of cards. This does have a lot to do with the fight or flight response that we are hardwired into, but it can be changed over time. Learning to focus on what you can control, on setting process goals (versus outcome goals) can take the pressure off and can be quite rewarding if you can completely buy in. A lot of people don't want to play people they are supposed to beat because they feel pressure on the result. Also, people will not give it their all and a true measure of their ability when they are competing against someone they don't believe they can or should beat. 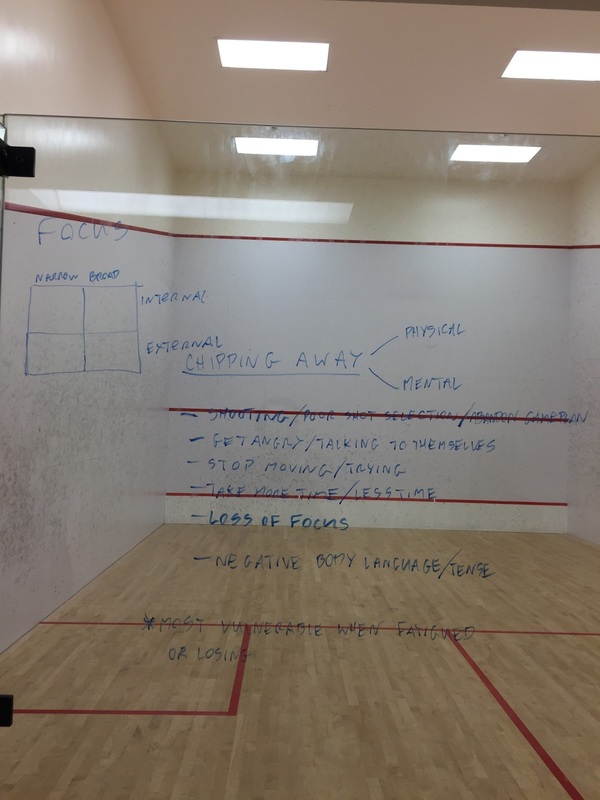 Learning to let go of your ego and focus on the process of playing your best squash day in, day out is the key to a life long process of becoming the best you can possibly be. We have to learn not to worry about defeat and get overanxious or over confident about winning and just play our game, to the best of our ability, every single point; that's how you play consistent level of squash and take pressure off of yourself. It also helps immensely if your coach and parents buy into this philosophy as well. 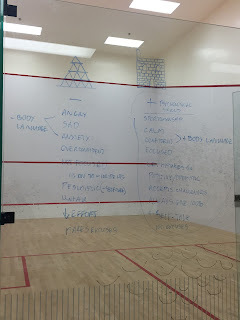 If you enjoy sport psychology as much as I do or have played a lot of competitive squash you'll appreciate many of the issues discussed today. All of the concepts sound simple enough and possible to execute, but are just as challenging to learn as any other skill set. Strategies that worked for me may not work for someone else, so finding new ideas to help people come up with a strategy that works for them is key. Sport psychology is an expanding area of elite level sport and many kids have begun not only learning more about this area, but working with sport psychologists too. 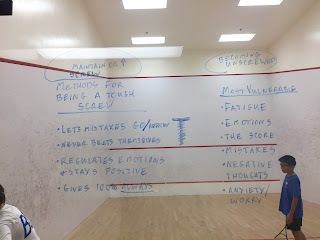 From time to time I also use visualization and relaxation, breathing techniques to help people focus, relax and imagine themselves playing their best squash and handling challenging situations successfully. Serious Squash is having a merch sale. It's currently 50% off all merch with the code 'iamserious' on SeriousSquashShop.com I am trying to clear out stock and make room for some new ideas. We will see what comes next. Also, if you haven't already done so check out the two Serious Squash instructional films, Mastering Deception and The Secrets Of Solo Hitting. They can both be downloaded from the Serious Squash Shop and come with a money back guarantee. Below is a short preview of the films.